My friend has recently bought Mezzmo to share and transcode media files for playback on Samsung LED 7000, which is DLNA compliant. Panasonic Lumix TZ10 (the European mode of DMC-ZS7) is not DLNA compliant, and she could not directly stream videos from digital camera to HDTV via DLNA. Is it possible to play the AVCHD Lite videos from Panasonic DMC-TZ10 with Mezzmo and stream to the HDTV? Mezzmo is Windows-based DLNA media server software to provide media sharing for DLNA-enabled devices. Mezzmo has a long list of supported file formats for videos, music, image and subtitle, e.g. FLV, M4V, AVI, MKV, MPG, and MP4. But my friend faced difficulty streaming the Panasonic ZS7/TZ10 videos on PC to the Samsung DLNA HDTV via Mezzmo. Aunsoft MTS/M2TS Converter is the recommended Panasonic ZS7/TZ10 AVCHD Lite converter, which will convert 720p AVCHD .mts to HD MPEG-2 .mpg for Mezzmo. Here is the step-by-step guide for you to transcode 720p AVCHD Lite files from Panasonic ZS7/TZ10 to Mezzmo for streaming to DLNA compliant device like Samsung HDTV. Step 1. Load Panasonic ZS7/TZ10 videos to Aunsoft MTS/M2TS Converter. 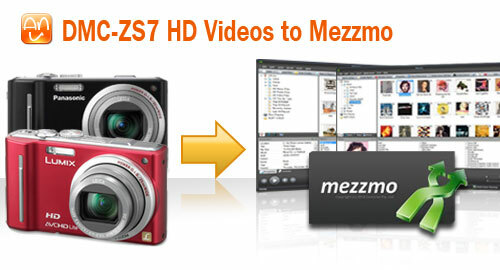 After transferring the .mts files from Panasonic DMC-ZS7/DMC-TZ10 AVCHD Lite camcorder to computer hard drive, run Aunsoft MTS/M2TS Converter as the best Panasonic AVCHD Lite to Mezzmo converter, and click the "Add" button to load 720p .mts videos. Step 2. Choose MPEG-2 .mpg format. 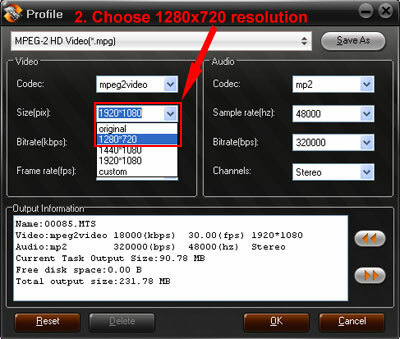 Click the "Format" option, and choose HD Video > MPEG-2 HD Video(*.mpg) as output format. The AVCHD to Mezzmo converter will transcode 720p MTS to MPG for Mezzmo. Tips: Since the Panasonic ZS7/TZ10 records 720p AVCHD Lite format videos, we can change the video resolution to 1280x720, instead of using the default 1920x1080 resolution in the Panasonic to Mezzmo converter. Just click the "Settings", and you will face the following window for detailed parameters for video and audio. Step 3. Convert Panasonic AVCHD Lite to MPG for Mezzmo. Click the convert button under the preview window, the conversion from 720p MTS to HD MPEG for Mezzmo will start immediately. After the conversion, copy the output files to the shared folder of the Mezzmo, and it is easy to play Panasonic HD videos on HDTV via DLNA and Mezzmo. How to Convert Handycam HDR AVCHD to AVI/WMV? How to Mount and Play Videos to Droid X in Car for the Car Travel?